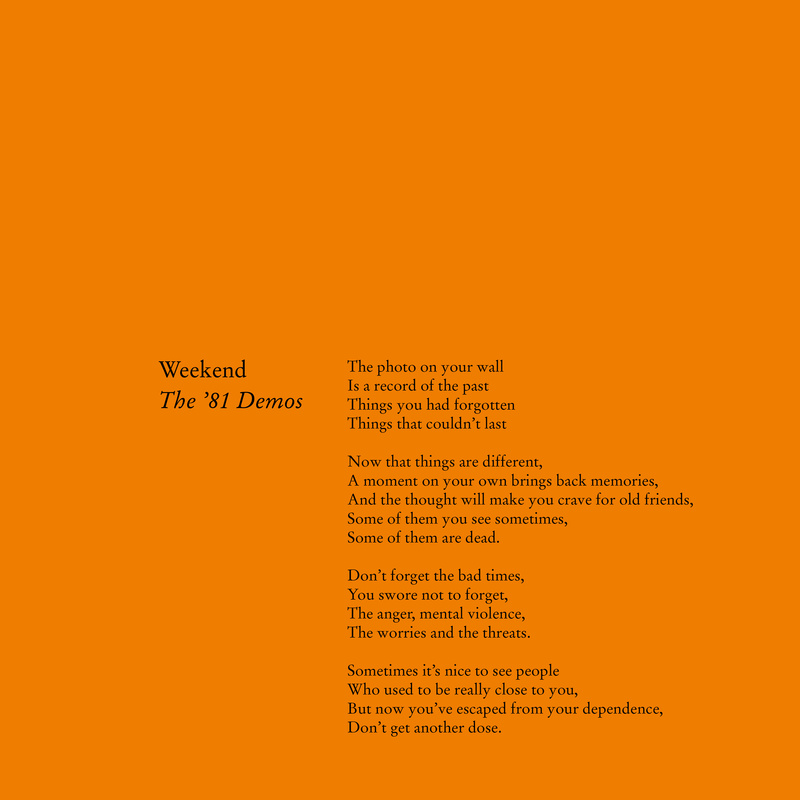 Weekend “The ’81 Demos” out on Blackest Ever Black – Chain D.L.K. Blackest Ever Black is pleased to present the first vinyl edition of the legendary demos recorded in 1981 by Weekend – the trio of Alison Statton, Spike Williams and Simon Booth. 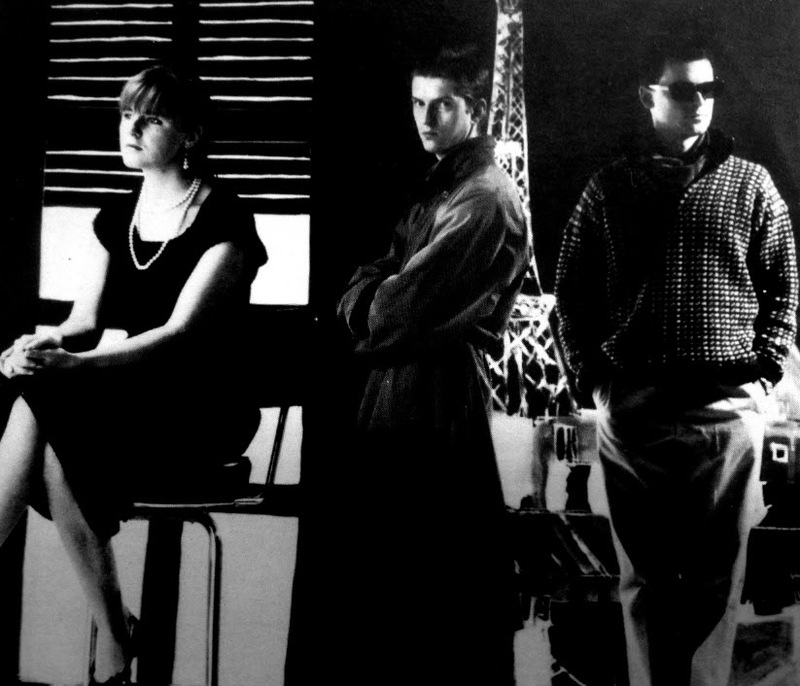 Alison Statton began her recording career with Philip and Stuart Moxham in Young Marble Giants, one of the most unique and important bands to come out of the UK post-punk/independent scene. YMGs dissolved in 1981, at which point Statton began writing with Wrexham native Mark ‘Spike’ Williams, one of the brains behind Z Block Records and a member of the band Reptile Ranch. They joined forces with guitarist Simon Booth to form Weekend, and recorded the exquisite demo versions of ‘Drumbeat’ (later titled ‘Drumbeat For Baby’), ‘Red Planes’, ‘Nostalgia’ and ‘Summerdays’ that are collected on this new 12″. At the heart of the record are two truly remarkable pieces: ‘Red Planes’ and ‘Nostalgia’. The former is a dubwise dream-pop epic, Statton’s dispassionate, Nico-esque vocal wafting over a clucking Boss DR 55 pulse and seismic bass detonations, while Williams’ violin, in Alison’s words, “soars and dives and weaves through every possible mood with no inhibitions, creating an almost psychedelic feel, with a menacing undercurrent”. It’s somehow both starker and more richly atmospheric than the version that appears on the band’s debut album, La Varieté (Rough Trade, 1982), not to mention significantly longer – nine minutes in total. Our only complaint is that it doesn’t last for nineteen. ‘Nostalgia’, meanwhile, is surely one of the most perfectly elegiac songs committed to tape in the post-punk era. More fleshed-out than the La Varieté version, the instrumentation here – notably Statton’s yearning recorder part (“Very Eno,” as Spike astutely observes) – amplifies the emotional resonance of an already heart-stopping lyric. Written by Spike and Dave Hoddel, ‘Nostalgia’ is a poignant meditation on the attraction, and the danger, of dwelling on the past. Shorn of the jazzy flourishes that would define the subsequent studio version, ‘Drumbeat’ (later titled ‘Drumbeat For Baby’) has a brittle, choppier quality more in line with Young Marble Giants than Weekend; it remains one of Williams and Statton’s most infectious compositions. The instrumental ‘Summerdays’, is a different beast entirely to the cut on La Varieté; it’s primarily a showcase of Simon Booth’s lyrical guitar-playing, at times reminiscent of the courtly psychedelia of early Felt or Vini Reilly, and reminding us of Weekend’s role as godparents of the nascent indie-pop movement. Jazz became an increasingly prominent component of the Weekend sound, and by the time of La Varieté– their sole studio LP – they had welcomed jazzmen Larry Stabbins (saxophone), Roy Dodds (drums) and Dawson Miller (percussion) into their line-up. But despite its idiosyncratic brilliance and long-lasting influence (Belle & Sebastian and Kalima are but two groups who owe it an enormous debt), nothing on La Varieté, or on the handful of singles and live recordings Weekend put their name to before disbanding in 1983, quite matches the raw, impressionistic power of the ’81 demos. The four demos were released as a stand-alone CD by Vinyl Japan in 1995, and included as bonus tracks on Cherry Red’s most recent CD reissue of La Varieté; however, until now they have never appeared on vinyl. Licensed from Cherry Red, The ’81 Demos (BLACKEST026) is a 12″ limited to 1000 pieces, mastered by by Matt Colton at Alchemy and housed in an LP sleeve printed on reverse board stock, with printed inner featuring liner notes by Spike Williams, Alison Statton and Simon Booth. It is due to be released on March 3rd, 2014. Stream the “Red Planes” demo below!